The trade war between China and the U.S. will not be ending soon. 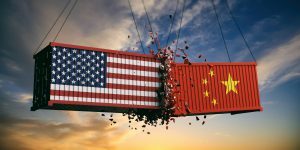 President Donald Trump recently told Agri-Pulse that “you’ve got to have a little time,” referring to when trade relations may return to normal or better status between the United States and China. President Trump is scheduled to meet with Chinese President Xi Jinping at the G20 meeting in Argentina, but those talks are not likely to propel any major shift toward reaching an agreement on the future of trade between the two nations. The trade war started with Trump’s steel and aluminum tariffs, quickly escalating to include tariffs on U.S. farm products, most notably soybeans and pork. Further, a recent survey reported by Reuters shows that 85 percent of U.S. businesses surveyed say they have suffered from the trade war’s tariffs, and nearly half of the companies reported increases in non-tariff barriers, as well.